Fiction – paperback; Thomas Dunne Books; 300 pages; 2006. Translated from the Swedish by Ebba Segerberg. Kjell Eriksson’s The Princess of Burundi won the Swedish Academy Award for Best Crime Novel in 2002 — long before Stieg Larsson hit the scene. It’s not your typical Scandinavian crime novel in which a single police detective takes centre stage; this one tends to focus on a whole police department and follows the steps they take, working together, to solve a brutal crime. The crime in question is the disappearance of John Jonsson, a dedicated father and collector of tropical fish (the title of the book is the name of a fish), who fails to return home after work one evening shortly before Christmas. His body is found the next day. There are stab wounds to his chest and arms, his fingers have been severed and there are cigarette burns on his body which indicate he may have been tortured. But in quiet Uppsala, a university town north of Stockholm, who would want “Little John”, as he is known, dead? Had he got caught up in something illegal with his brother, a known criminal? Or had he wracked up gambling debts? When a local woman is killed in her home a few days later, police wonder if the murders are linked. Is there a serial killer on the loose? While the blurb on the American edition of this book is slightly misleading — it claims a “killer terrorizes an entire frightened town” — the focus of this exceptionally nuanced novel is more on the outfall of the murder on the victims and family members left behind. John was married with a teenage son, both of whom are wracked by grief and unable to comprehend why anyone would want him murdered. And then there is his brother Lennart, who is filled with so much venom and rage he will do almost anything to avenge John’s death. Coupled with this exploration of a family’s sudden bereavement, is a detailed police procedural in which we are introduced to a vast cast of law-enforcers — a dramatis personæ would have been helpful — all of whom are dealing with their own problems and insecurities but are wedded together like a tightly knit family. But my personal favourite was the world weary chief Ottosson, a man who has been in the job so long “evil was exhausting him”. During meetings and briefings, in which he holds sway, a philosophical tone sneaks into his arguments — he’s less focused on the crime in question and more interested in the underlying social reasons behind it. Not all of his colleagues agree, but there are some interesting debates about social welfare, immigration and the decline in educational standards that make The Princess of Burundi an intelligent read. It is a dark, brooding, atmospheric story, one that is deeply insightful and perceptive. And while the solution to the crime isn’t particularly satisfying, as a study of the effects of that crime and the ways in which the police go about their business it is a very fine book indeed. There are several more in the series which have been translated into English, including The Cruel Stars of the Night, The Demon of Dakar and The Hand that Trembles. I liked the first one enough to want to read the rest…at some point. I love world weary police chiefs! Have you ever watched/read Inspector Morse? I love the way John Thaw depicted this character. I haven’t always enjoyed books authored by Swedish authors, but I do keep giving them a try! I really liked the Stieg Larsson trilogy. I only read the first book in the Steig Larsson trilogy and didn’t like it enough to pursue the rest in the series… But I do generally like Scandinavian crime and have read a lot of it over the years. I’d not heard of him, Stu, it was just a book I saw in Waterstone’s while browsing one day before Christmas. It sounded like my thing so thought I’d give it a go. Am glad I did. Despite the murder element it was an appropriately “festive” type of book seeing as it was set in and around Christmas. 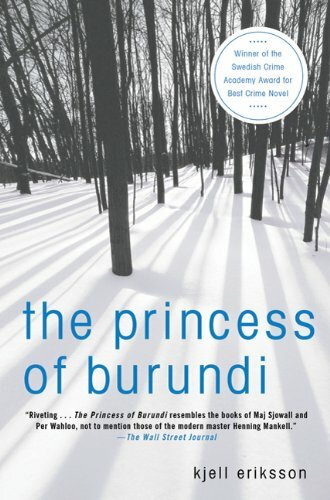 I haven’t never read Kjell Eriksson’s “The Princess of Burundi”. But I like the plot of the book. Agreed that is something new in comparison with other crime novels. So, I will defitely find a free time to read it. Thanks!